When it comes to estate sales, the contents of a home often vary, however it’s very common to find area rugs in almost every home. From contemporary area rugs to antique Persian rugs and tapestries, researching and properly pricing them can be quite a task. We hope to shed some light on estate oriental rugs and provide you with a useful guide that will help you along the way. Are Oriental Rugs and Persian Rugs the Same? Using the correct term is extremely important when identifying and selling estate rugs or any items for that matter. The terms are often used interchangeably but they’re quite different. Persian rugs are made in the Middle East, specifically in Iran which is formerly recognized as Persia. Persian rugs are a sub-category of Oriental rugs. The Oriental Rugs which also include Persian Rugs can be made in the middle east or Asia such as India, Egypt, China, Pakistan and Iran. Persian rugs are Oriental rugs, but not all Oriental rugs are Persian rugs. Today, the term is used to identify style, technique and design rather than identifying the region it came from. There are over a hundred types of rugs which identify the village it originated from. Some of the most popular rugs are Tabriz, Kerman, Asfahan, and Kashan. These are the names of the towns in Iran where the Persian rug is made. Tabriz is highly desirable and so are the rest by avid collectors. The designs of these rugs are so distinctive, an avid collector automatically can determine the name of the rug by simply looking at the design on the rug itself. In order for a rug to be labeled an authentic Oriental or Persian rug, the rug must be handmade by a skilled artisan. Today many parts of rugs are machine made, like the dye and the thread used, however it’s still knotted by hand using the same techniques rug weavers used for years. Antique Persian rugs are sought after for their artistic appeal. Their vibrant colors, unique patterns and designs show amazing skill by the artisans. Is the Rug Hand Made? Identifying how a rug is made will help you further determine its value. 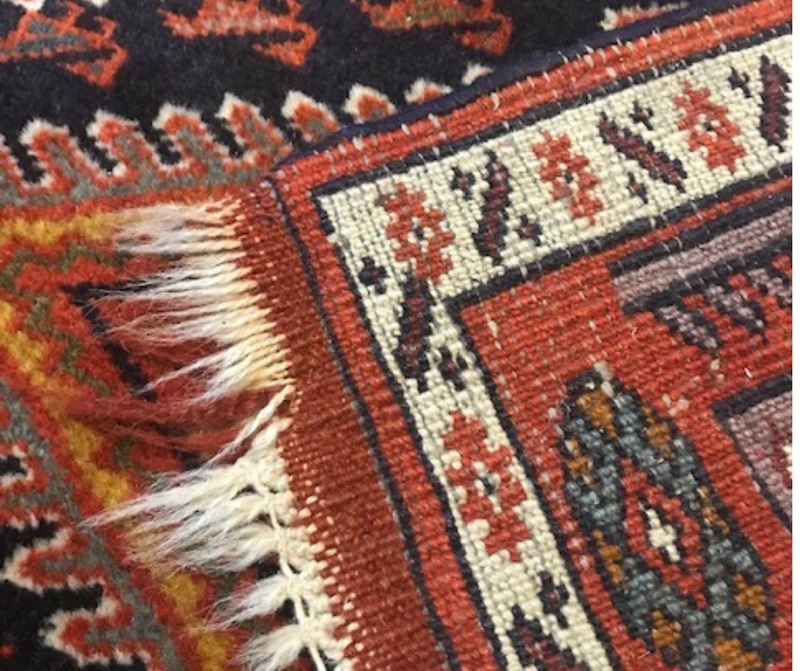 As the manufacturing process evolved, machine made rugs were made to mimic high quality hand-knotted rugs, therefore it’s important to understand the difference in order to determine proper value for an estate sale. Often referred to as Oriental rugs, these rugs are 100% made by hand using a loom. The process of making the rug is labor intensive, the weaver inserts knots into the rug to tie each one by hand. Just like a free-hand drawing. A hand knotted rug is made without a design outline to follow. Masterful artisans can take months to complete one rug, depending on the pattern details and material used. The finished product is worth the wait. Hand-knotted rugs increase in value as they age. They’re often kept as family heirlooms and passed down from one generation to another. Since they’re not mass produced, each rug is considered a one-of-a-kind find by avid collectors. These rugs are made on canvas backing which is outlined or filled with the design. They’re not 100% handmade but do require a person to shoot pieces of wool through the canvas backing. To quickly compare, it can take anywhere between 6 to 9 months to complete a hand-knotted rug, but a hand tufted rug can be completed in a few days. As an estate sale professional, it’s important to establish fair market value. They can be deceiving when compared, you must pay close attention to the difference between handmade and hand-tufted rugs found at estate sales. Photo of a machine made rug, as you can see there is no design duplication on the back. Often called “low effort rugs”, they’re made by machines, mass produced, and don’t hold much value. The guide to pricing these rugs at estate sales will require looking up the tag on the back, using your experience and judgement based on the condition and size of the rug. They’re readily available at discount stores, and easily replaceable. The hand-knotted rug is often more valuable than the hand tufted rug, which is more valuable than the machine-made rug. If you’re new to the estate sale industry, and rugs in general, here are a few tips you can use to begin identifying how a rug is made. Flip the rug over and look at the back side. If the back side matches the front side, it’s very likely a hand-knotted rug. Hand knotted rugs do not have any backing applied, however hand tufted and machine-made rugs have a latex coating on the back in order to hold the tufts in place. 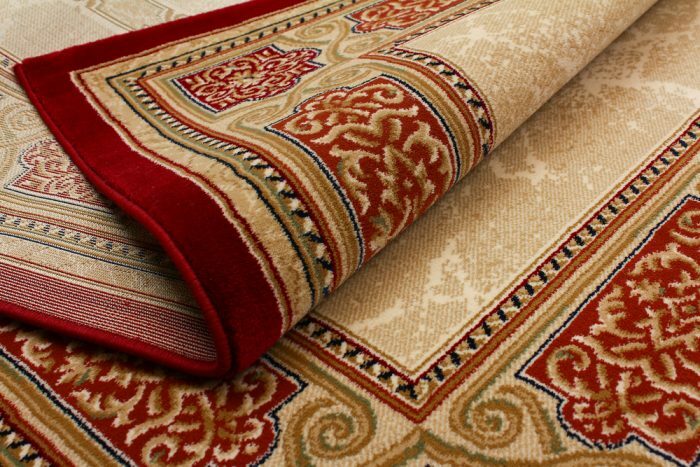 The fringe on a hand knotted rug literally holds the rug together, the knots on them are extremely tight and do not come apart easily. The fringe isn’t sewn or glued on, but rather continuous with the rug thread. Try rolling the rug, if it doesn’t have much symmetry, it’s more than likely a hand knotted rug. Hand knotted rugs are never perfectly uniform in size since they’re individually made and not mass produced. Once you begin seeing the difference between the two, it becomes second nature to you. Identifying the difference in how a rug is made is the first step in determining its origin and value. Once you’ve identified how a rug is made, the next step is to identify material and condition. Wool and silk are the two most common materials used in handmade estate oriental rugs. Silk is always deemed more valuable because the thread is extremely thin, and the design details are much harder to achieve. To tell the difference between the two is quite simple. A large silk rug is very light in weight, can fold down like a towel. To identify that it’s true silk and not manufactured silk, rub the palm of your hand over the surface of the rug for a few seconds. If your hand becomes warm, the silk is real. Silk oriental rugs have a shine to them, and the fringe at the end of the rug is made of real silk. If you own a Persian rug, it’s valuable. Since September 2010, the U.S. government put in place an embargo against goods from Iran. This includes Persian rugs coming into or going out of the United States. You can buy Persian rugs that are already in the country without recourse, but by excluding the importation of these rugs, the pool of available merchandise is diminished, thereby increasing their value. How Old is the Estate Rug? Persian Rugs increase in value as they age. In the past, many merchants wouldn’t sell rugs as soon as they were finished. Many would wait for them to age in order to increase the price. How Important is the Rug Design? The finer the design, the more valuable a rug is. If it’s larger designs with more solid spots, less labor was involved in completing the masterpiece, therefore it’s less expensive than one that has a lot of fine details in the design. Designs that include animals in Persian rugs are also considered valuable. If you didn’t know much about rugs to start with, this article gives you a few tips on how to identify a few differences between valuable and common rugs, to determine value is a whole different process and isn’t as easy as you might think. Estate Oriental rugs are art pieces. Besides type, origin, material, and condition, the value of a rug is determined by how desirable the buyer finds it. One may spend thousands of dollars on a rug if they find it attractive, and you couldn’t sell the same rug for a few hundred dollars to someone else that thinks it’s ugly. It is said that a Persian rug is like a piece of art that attracts its viewer. It seeks its buyer, because it’s a display piece that must fit! When a 17th Century Antique Persian Rug was given to Sotheby’s to auction, it was expected to fetch 10 million dollars. To everyone’s surprise, it shattered all previous records by becoming the most expensive rug ever sold at $33 million. The previous record was held by Christie’s for selling a bright blue colored leaf pattered rug from Iran’s 17th century which sold for $9.6 million in 2010. Prior to that, the most expensive rug sold was also a Persian rug for half of that at $4.3 million. For the sake of due diligence, always ask the seller if they have an appraisal for any item in the home or if they believe the estate rug you’re selling is valuable. It’s uncommon to find written appraisals, but it’s worth asking. If the time allows, getting an appraisal on a rug you’re trying to sell may be worth the time invested. The general rule of looking up comparable prices online will get you nowhere fast with antique estate Persian rugs. Let’s say you’re looking at an antique estate rug you were told is Persian Tabriz that’s over 60 years old. I’m not exaggerating when I tell you the price range can be anywhere between $1500 to $1 million dollars. A catalog, online research, Ebay, or other sites you use to find comparable prices is a waste of time. 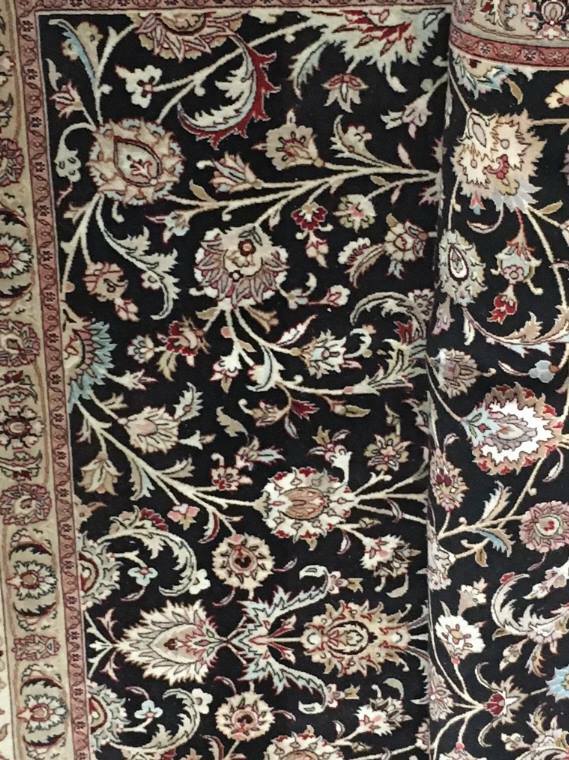 How to Price Oriental Rugs at Estate Sales? Finding a local, reputable rug dealer that can give you a range of pricing when you contact them would be wise. Pricing items at an estate sale properly is extremely important, if you price too high, the items will not sell, if you price too low, you’re costing yourself and the client money. Some dealers can charge up to $500 for each written appraisal, and around a $100 for a verbal one. Determining whether or not to do this will be based on the estate rug itself. Determine if it’s handmade or machine made. Determine whether it’s silk or wool. Evaluate its condition (stiff, soft, clean, dirty). Count the knots on the back. Since each knot is a rug is tied by hand, a weaver can tie approximately 8000 knots per day, the more knots per square inch, the more valuable it is. As mentioned above, it can take up to 1 year to produce a 9’ x 12’ hand knotted oriental rug. Guide to counting knots. Design! This is a big deal because design will make a huge difference in the pricing. If the design is really fine and detailed, it’s a valuable piece. If you’re not a professional rug appraiser, you’ll never get the pricing exactly perfect on antique Persian rugs. Even professional appraisers are shocked at the price a rug will fetch in auction after they’ve established value. The goal of this article is to provide you with tips to at least determine the difference between a common every day rug and one that may possibly hold a lot of value. What you do next to price it is at your discretion and the clients’ decision. Always rely on a professional when you suspect an item has high value. EstateSales.org is your central hub for all things relating to estate sales. Whether you’re new to the industry or have completed hundreds of estate sales in your career, we welcome your opinion, advice, and participation in the estate sale community. 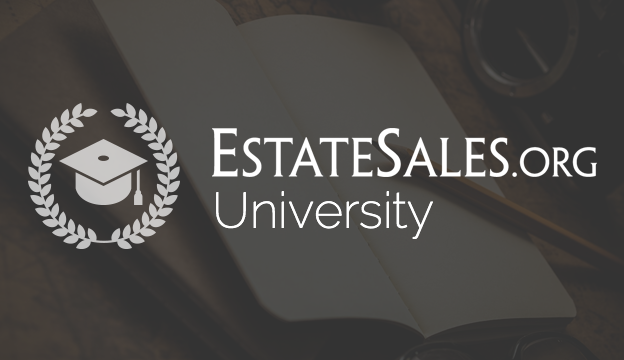 Join our private Facebook Group dedicated to the estate sale industry professionals where you can share, ask, and grow your business with others.